Wonderful jacket, love the leather very light weight. 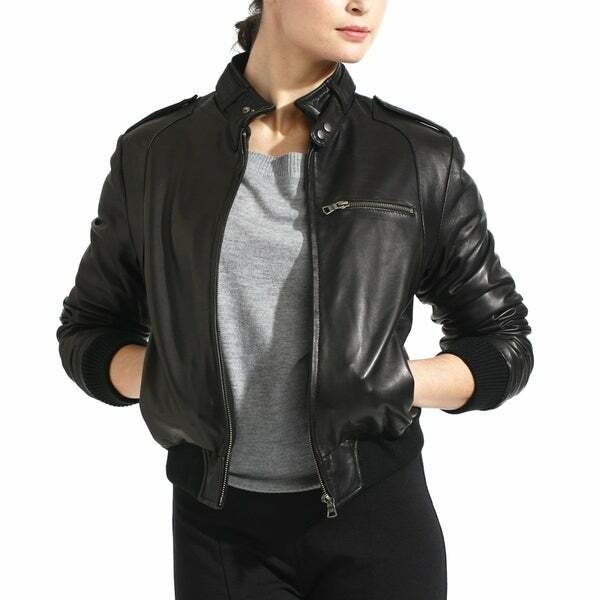 This attractive lambskin leather jacket features a slim fit with knit cuffs and waistband. A beautiful Italian lambskin leather lends to the softest hand. A moto collar with a snap tab closure finish the stylish look of this fully lined bomber jacket. Please order according the the size equivalence below to ensure perfect fit. Model stands 5'7 tall and has a 34-inch bust, 25-inch waist and 35-inch hips. Model is pictured wearing a size medium. I ordered a large jacket, my normal size, and this one was a little small on me. Also, when I zipped it up, the seams on the inside pressed through and were visible on the outside. The coat is very warm, it is lined. This may work better for someone with a smaller bust. My wife loves this jacket. It's very soft leather and nicely finished. My only complaint was their sizing chart. I had to order this jacket twice. My wife typically takes a 'Medium' in jackets. However, this jackets 'medium' was at least two sizes too small. So, we went for a larger size and it fits perfectly. Ordered the largest size available, a 5X. The sizing in the arms/shoulders is waaay too small compared to the torso. This could be the lining or the leather, hard to determine. The torso/waistband width were a bit too large. There is NO way this sizing makes sense. Huge disappointment. Buyer beware! I love this sporty jacket! I don't drive motorcycle but I just love the style and the quality is so nice! It's Lambskin leather! Thankful Overstock has this jacket for cheaper price! I bought this jacket for my god daughter, it was great quality and a perfect fit. She loved it. "What is the chest measurement for a medium? And if it doesn't fit can we return and get a different size or refund free?" "How long are the sleeves on a size M?" Hello Rattlepeace, the length from shoulder seam to cuff is 25" for size medium. The ribbed knit cuff is elasticised and will stay adjusted if pulled up. I hope this helps. Please let us know if you have any additional questions. Thank you for shopping with us! "And does that 20-22 inch measurement from the previous question include the collar?" Hello, great question! Yes that would be from the collar. "What is the waist and shoulder measurement on the 2x?" Thank you for your question. The measurements are Shoulder width-17.5" Straight across Bottom Waist-18" Please note that the waist is a tight elasticized knit waistband. "What is the measurement (how long is the back center seam) on the Tanner's Stella jacket in a medium and a large?"